400 years have passed since the vampire Kain damned the world in the original Blood Omen, choosing to rule the world in damnation rather than die for its salvation. Now Kain, who once controlled the land of Nosgoth with his vampire armies, finds his brethren slain and his dark powers stripped by a mysterious figure. To reclaim his rule and exact his vengeance, Kain must dispatch armies of zealot soldiers and overcome legions of demons in order to uncover the ominous plot that threatens the land he seeks to conquer. 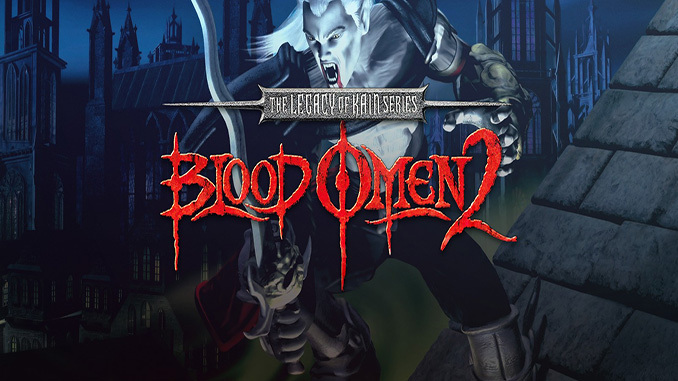 Blood Omen 2, the second instalment in the Legacy of Kain Series, is a 3rd person 3D action/combat game in which you assume the role of the vampire Kain. A compelling story takes you through huge, lushly detailed 3D environments and challenges your skills in combat, puzzle solving, stealth and exploration. With each success, you’ll gain new dark gifts that will grant Kain the ability to access treacherous new areas to explore and the power to face stronger, more aggressive enemies. As you develop a stronger, more skilled vampire, you’ll be rewarded with dozens of dazzling in-game cinematic sequences that unfold the continuing epic of Nosgoth, and Kain’s attempts to ultimately rule over it. – Move through crowds unseen cloaked in stealth, travel stories above the peasant herds on which you feed leaping from rooftop to rooftop, and use mind-control on hapless fools to help you overcome vampire-proof inventions. – Unleash your wrath in a lushly detailed, blood-chilling gothic environment that is not only gorgeous to the eye, but also alive with the soon to be dead. – Beautifully choreographed combat with surgical precision as you engage armies of demons and humans alike. 400 years have passed since the vampire Kain damned the world in the original Blood Omen, choosing to rule the world in damnation rather than die for its salvation. Now Kain, who once controlled the land of Nosgoth with his vampire armies, finds his brethren slain and his dark powers stripped by a mysterious figure. Okay this is working perfectly fine, thank you for uploading this link. I am downloading other link as well. This is a great site. You’re welcome 😀 have fun! Does this game work on PC? because is one of the most unplayable games in the LOK series. It freezes randomly and frequent. On steam people say this all the time so I want to know before I download it…. does it have issues? It’s crashing on my windows 10.How can i play without error? You can try to install the needed software’s from Microsoft Windows like directx, visual c++ and .net framework.